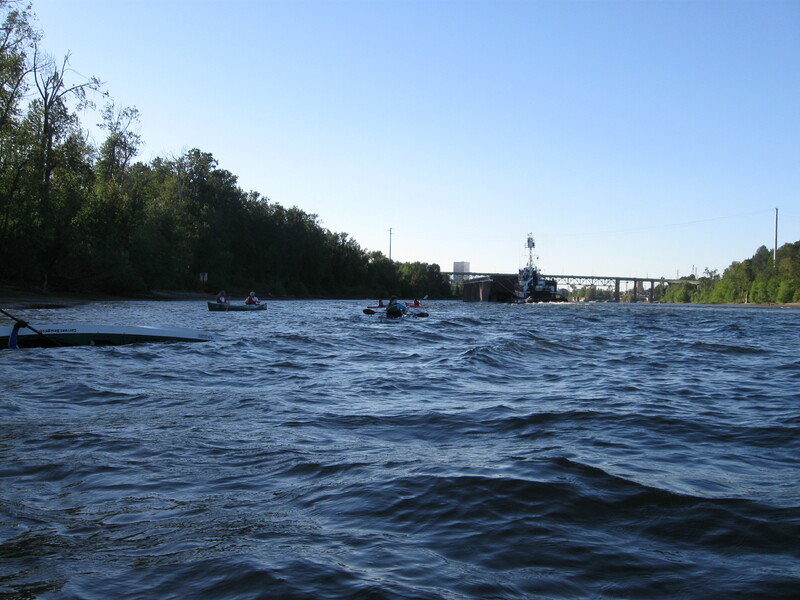 On September 12th, 2010 at 9:00 a.m. join more than 300 enthusiastic environmental stewards taking part in the Clackamas River Cleanup! 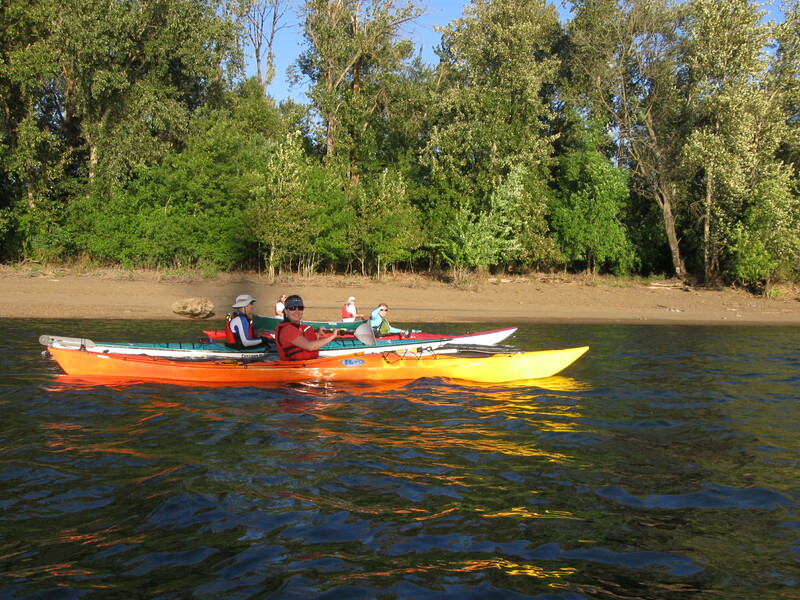 Clean 15 river miles of the Clackamas from Barton Park to the mouth! After the cleanup head back to Barton Park for a tasty picnic and bbq – there will also be music, fun, and a silent auction where you can grab gear on the cheap! 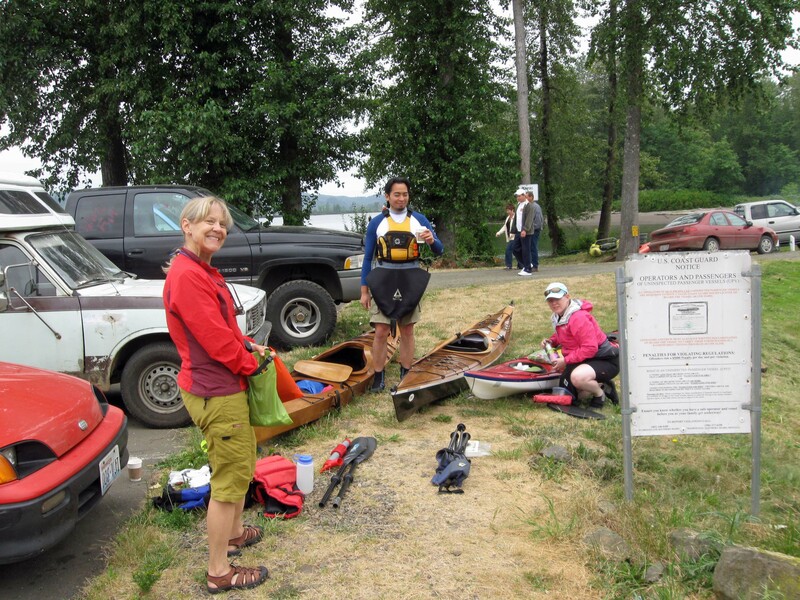 It’s day two on the Lower Columbia River Water Trail. Wow, I woke up today on the beach at Lark Island feeling fantastic! I had a rock solid sleep. Since sunrise is so early in early summer, I use a face mask – and I wear ear plugs to block any noise. But the best thing is my recent REI On-Air Adjustable Pillow inflatable travel pillow. It’s U-shaped and goes around your neck. It doesn’t matter if you sleep on your back, or on your side. I also use a stuffed dry bag to support my arm. Finally, nights in the tent are totally comfy! I awaken to spy Jessie across the way stirring getting up. Monte has been up a while, and coffee is already pouring. Ahhhh, that’s what I needed! Rubbing eyes and doing a couple jumping jacks and stretching, we all gather at the beach kitchen. The day is gray, but it didn’t rain! We cook up a lot of oats – I sprinkle it with blueberries, raspberries, yogurt and nuts. All good! We take our time, but all the same, we get ourselves packed up fairly pronto. Today, the tide is outgoing all day – it won’t be slack until around four. We pick a channel between two islands. Most of this route the depth is less than one foot and the tide is out going. We can’t afford to putz around. We spy more eagles, ospreys, blue herons, kingfishers, goldfinches, and thrushes. We’re just enjoying the water! Tenasillahe Island is one of the many islands in the Julia Butler Hansen Refuge for Columbia White-tailed deer (Columbian White-tailed Deer National Wildlife Refuge). On the downstream side of Tenasillahe is located Welch Island, one of the many islands in the Lewis and Clark National Wildlife Refuge. Coming around the end of our little island hopping exploration, we decided to go ahead and take the long route across the channel back to Skamokawa. The main Columbia River channel did not look like such a harrowing experience. Out in the main channel we had current against us and wind behind. There were some “swells,” coming from Astoria, which would come from astern, and a lot of refracted waves along with the swells. So there was a lot of disturbed water. But nothing overly challenging. When I took out, I was wobbly on land from all the up and down motion! Jessie said that she’d been out here with dumping waves and she got flipped and had to be rescued. April also was out here in really tough conditions. We paid close attention to a tug with a barge, but it was a ways off and came around and passed us. That was the only consideration. Later, we rounded the marker at the end of Skamokawa, and entered the harbor. Nice job everyone! 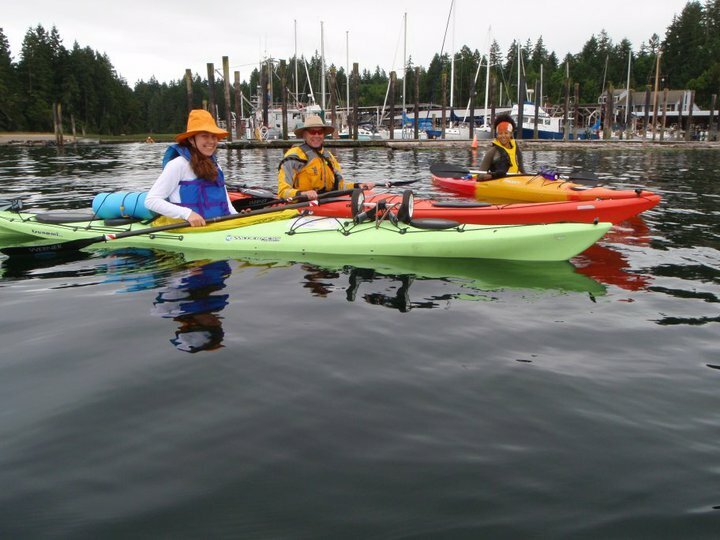 Very welcoming to be back at Skamokawa – it’s home to Columbia River Kayaking. We took a couple of days to explore the lower Columbia. We saw eagles dog fighting with ospreys, a sea lion, many fishermen and ships, Caspian terns, and best of all more fireworks! I strongly believe this is one of the top places near Portland, Oregon to paddle. Yet, it’s very under appreciated! 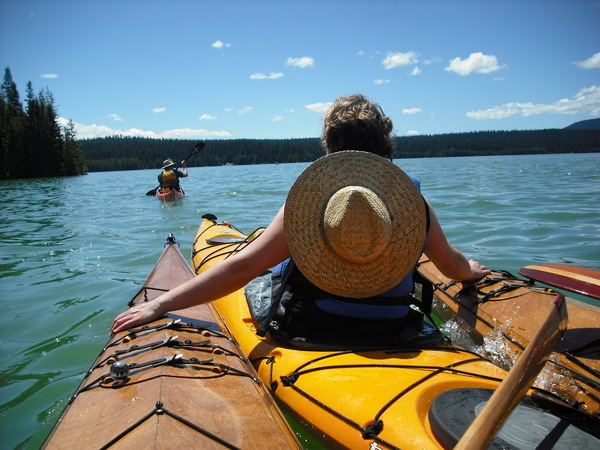 This weekend I scheduled a Lower Columbia River Water Trail kayak camping trip for my Paddle NW Meetup group. 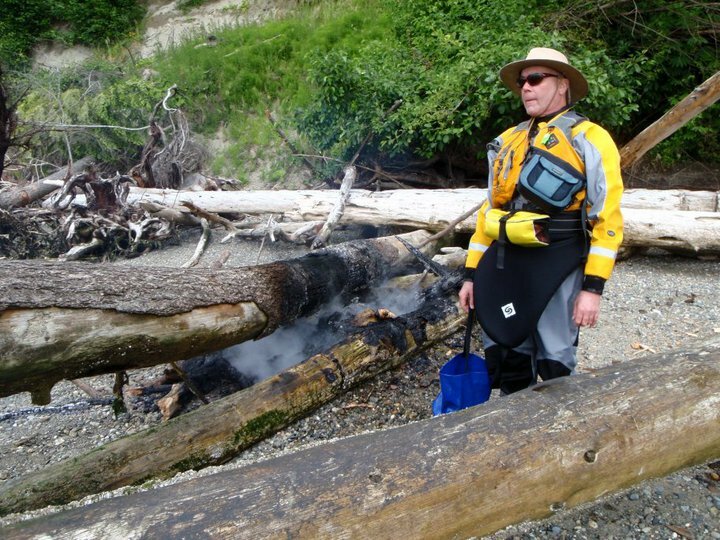 The idea was to leave Cathlamet, paddle out to Lark Island, set up camp, and then spend the afternoon playing around in the frequently challenging conditions in and around Skamokawa, WA, on the Columbia River. 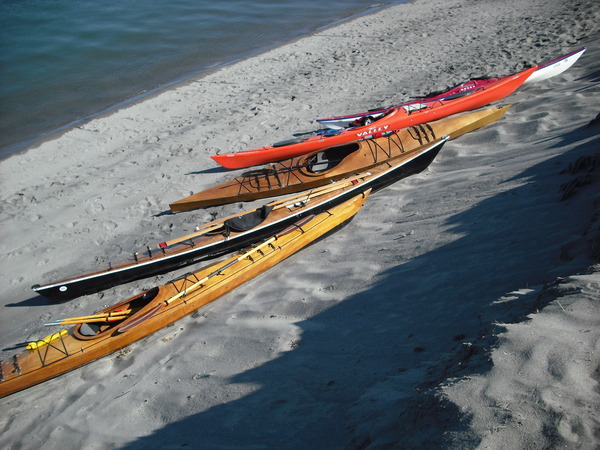 Then the following day play around the islands on the Oregon side, paddle west with the outgoing side, and then take out at Skamokawa. Paddlers were myself, Monte, Jessie, Francis, and Heather. A great group! 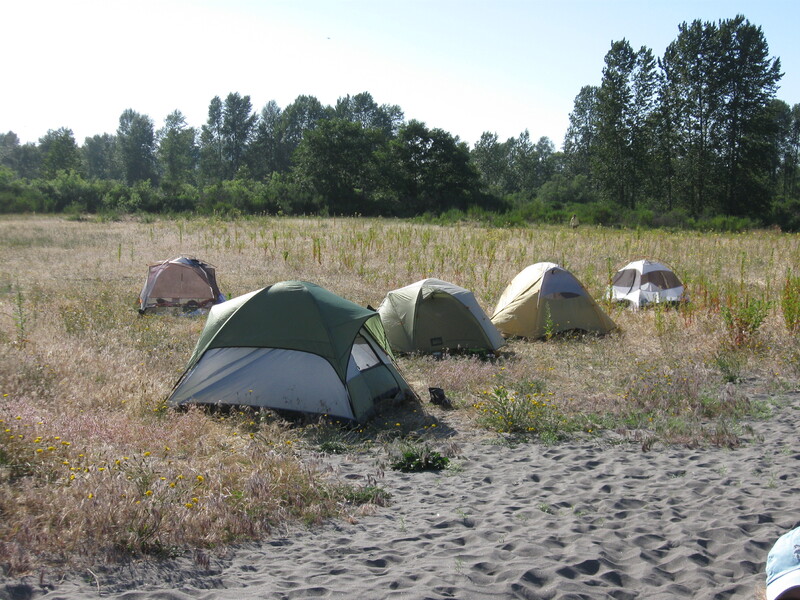 Everyone experienced with primitive camping. 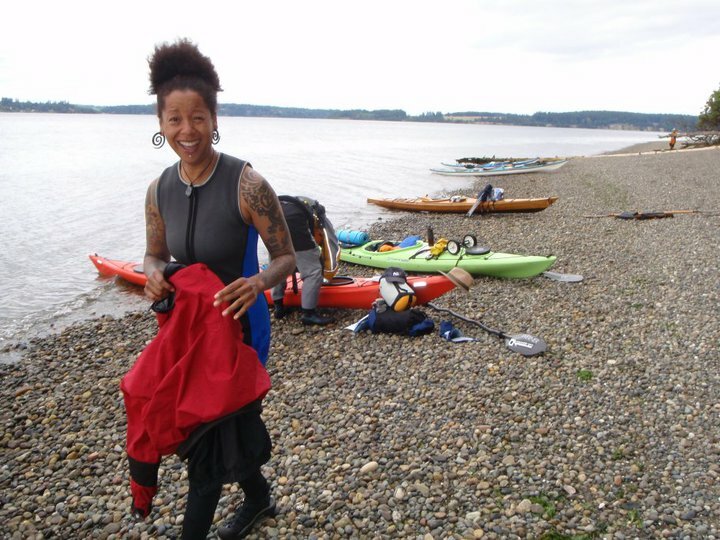 We met down at Skamakowa Paddle Center and I filed a float plan with Ginnie Callahan. Tanned, healthy looking and fresh from her southern experiences in Baja Mexico and Tasmania, she took down our float plan. 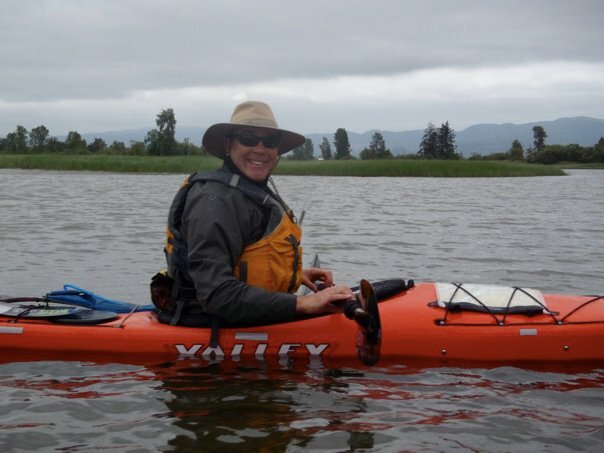 She took great interest in Paddle NW, as she is having some challenges putting together Meetups for her Lower Columbia Kayak Roundup, August 19-22. I gave her my business card and said I’d promote it on the Meetup site. 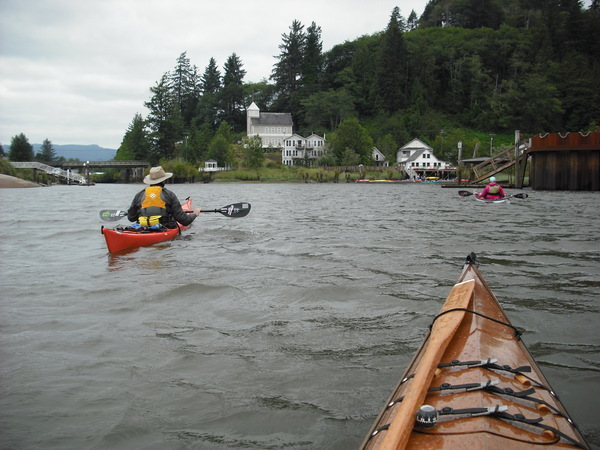 We met back at Cathlamet’s Elochoman Marina, which was the put-in. 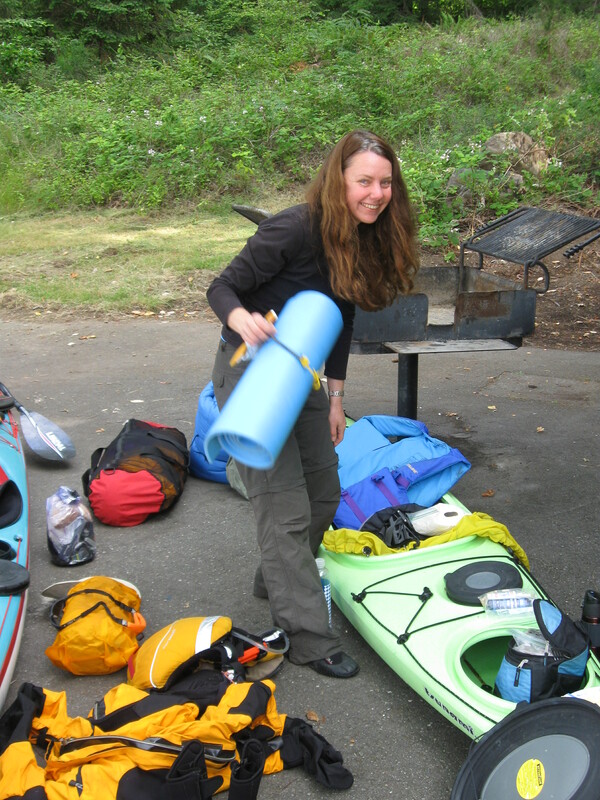 The usual stuffing and cramming of gear into kayaks ensued. We were all with good spirits! Monte was very accommodating, his Hyundai parked to take anything we needed to keep ashore. Jessie had the compass on board and I had the charts. We did the pre-launch briefing…oriented ourselves to the charts, and then we were off. We had a marine layer of clouds but it was forecasted to burn off. I didn’t know prior to scheduling this paddle, but today was “Eagle Day” at Cathlamet! Eagle Day brings plenty of wooden boats and then in the evening fireworks! Hee hee. 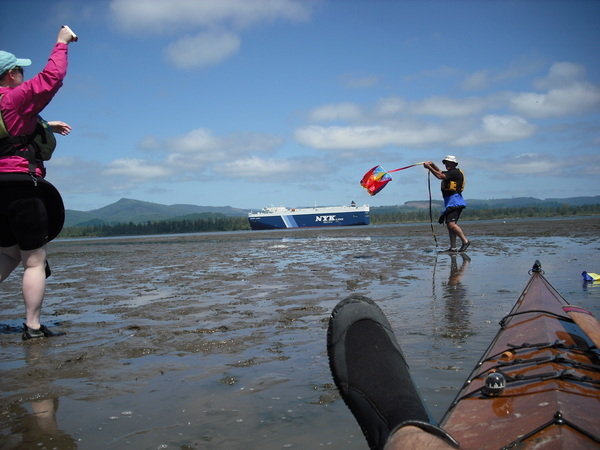 We took off paddling with the outgoing tide down a slough behind Ryan Island. This conveniently allowed us protected passage and wildlife viewing! Here is Jessie checking out a wily raccoon. 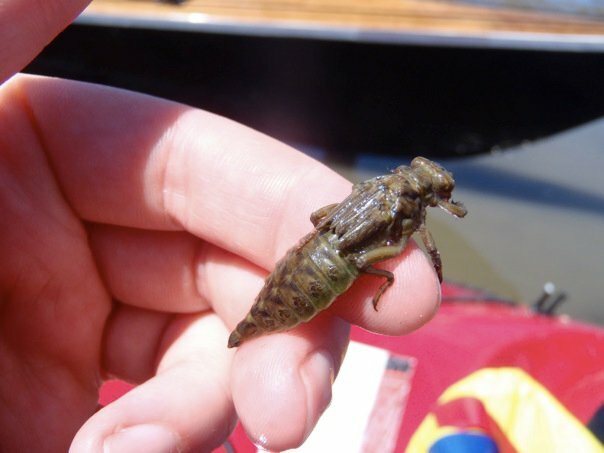 This guy was determined to finger the mud for food – I imagine it was clams or insects hiding in the mud. I love watching raccoons using their fingers. One day they will be texting each other! 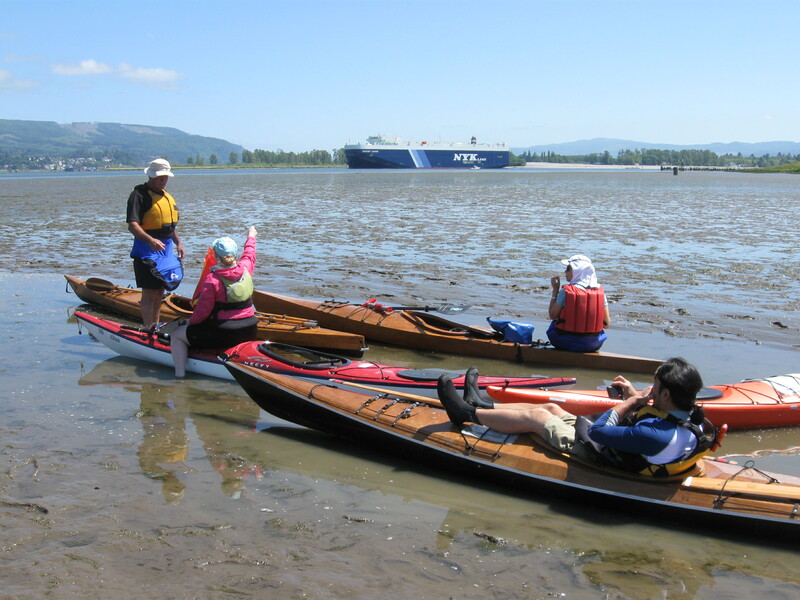 Soon we emerged into the Columbia River for a crossing of the shipping channel. To our port lay the tip of Puget Island. This is a blind corner, and Ginnie Callahan warned us to hail over VHS before crossing, because ships headed west can emerge there without warning. We needed to gather into a tight group and head across. After hailing, we ferried across, but the current kept trying to sweep us below our target, and we had to keep correcting our angle to “crab” across the current to make our end target on the other side – which was Lark Island. Once over, we beached and checked out the situation. Ginnie had suggested a camping spot, but it was already occupied. Then a friendly fisherman told us his spot would become available once they took off. So we decided to paddle around the island and come back when the fisherman was gone. The chart said 1-ft of water was available behind the island. So I said give it a go, we’d be able to circumnavigate no problem. But nope. Things have changed since the chart was made! We grounded about 100 yards from the end. Time to use the handles on the boats for their intended purpose! That would be towing by hand. Grounding? No problem. Excellent time to have lunch and fly the kite! If I could only find my peanut butter. It was stuffed somewhere…but I did not find it until dinner…freaking annoying. 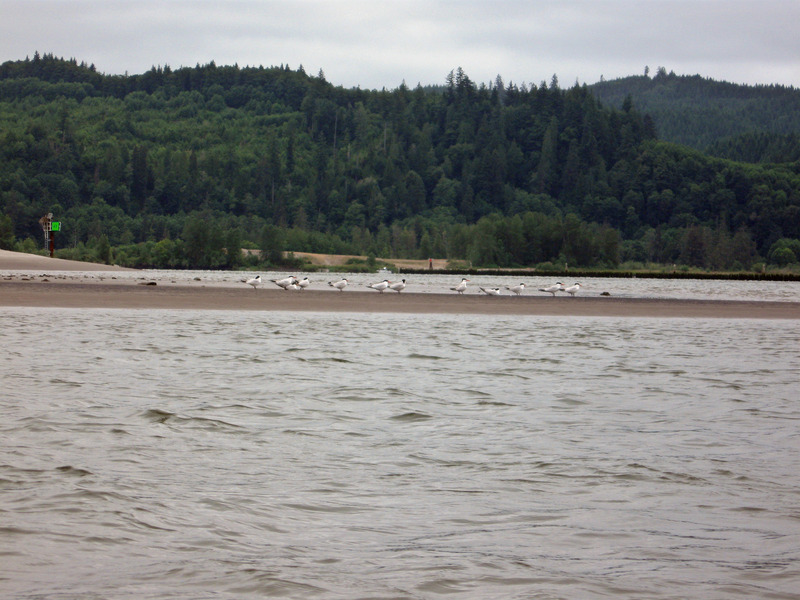 We also witnessed lots of eagles, ospreys, terns, seagulls and some white pelicans. A giant car carrier passed us by. And we saw some interesting creatures in the mud. Later this day everything turned out wonderful! Sun, warmth, all the good things. 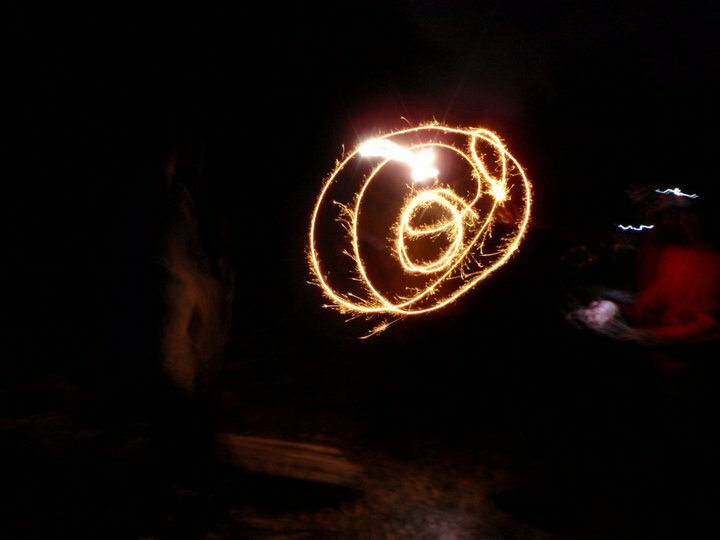 We set up tents, gathered lots of fire wood, shared stories, made munchies, cooked sausages on sticks, and more. I was dog tired and lay down for a bit! We enjoyed Heather’s raspberry/lemon squares for dessert and marshmallows over the fire. Then, the Cathlamet fireworks began, and we were impressed! Lots of original sky art for all! Finally, maybe 10:30 p.m. we bed down for the night! April Obern scheduled an after work paddle for tonight and a number of us showed up. Jessie, Phil Stanton, Jim, and two ladies with the same…Kristi! One of them I sold my Riot Brittany last year…and it was great to see my old boat out there! I must say my old boat (not really very old!) looks great with Kristi in it! Such a pretty yellow/orange blend. Very pretty shape! It was a beautiful evening. Temperature 86 degrees – wonderful to be on the river. And, the river was very warm! So several of us were rolling for practice. 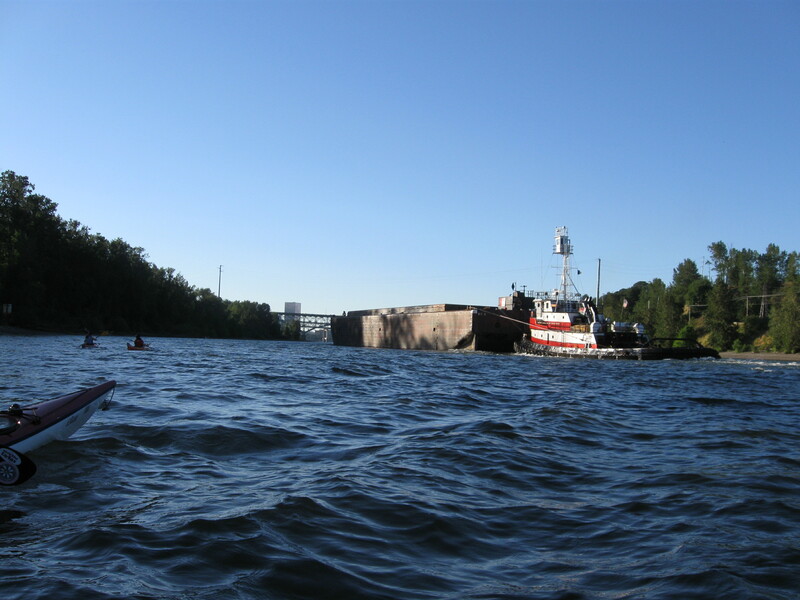 When we passed the Ross Island Lagoon, a tug and barge was pulling out of its dock. We had to pull over to the port side of the passage to allow it to pass. Kind of looks like the barge sent enough waves to capsize Phil! Not so, in this photo, Phil is just practicing his roll. What a nice night! We really enjoyed being out there! Day Two on the Cascadia Marine Trail! Woke up amazingly refreshed at Joemma Beach State Park! I didn’t use the rain fly on my REI Quarter Dome T3 tent so all the early light was surrounding me. But as I was prepared with my face mask and ear plugs, I did not arise until about 6:45. And when I did, I couldn’t believe how dark under that mask it was, and how bright once I took it off! Wow! Others told me crows had been crackling keeping them up – I didn’t hear anything! I also used this new REI inflatable pillow. I used it to support my still recovering shoulder, and this made my night SO much more comfortable! No more achy shoulder! No more rolling around to get it into a comfortable position. Sunday was July 4th, so fireworks were a big part of the day’s activities! 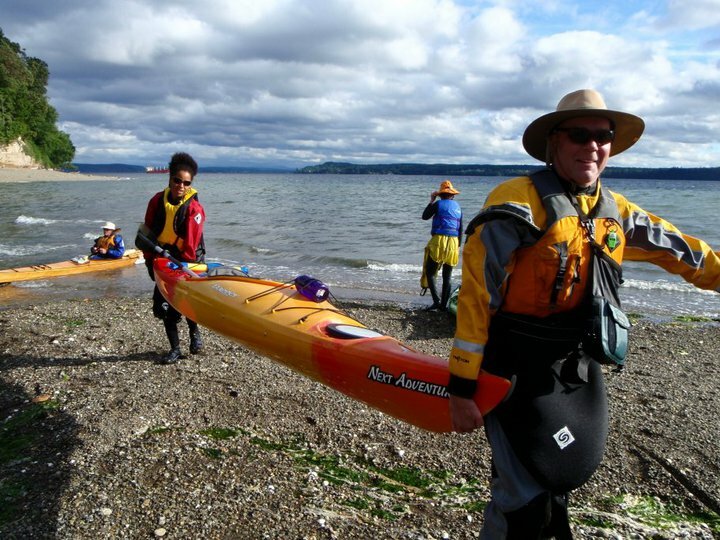 We decided to do a lazy start, wait for the late morning high tide, and then head down southward toward Anderson Island. We got a little ambitious and made a last minute plan to head to Eagle Island State Park for “lunch,” not really taking into consideration that it was already well past eleven o’clock. Eagle Island is 7.5 miles from Joemma Beach, and we just got over ambitious. 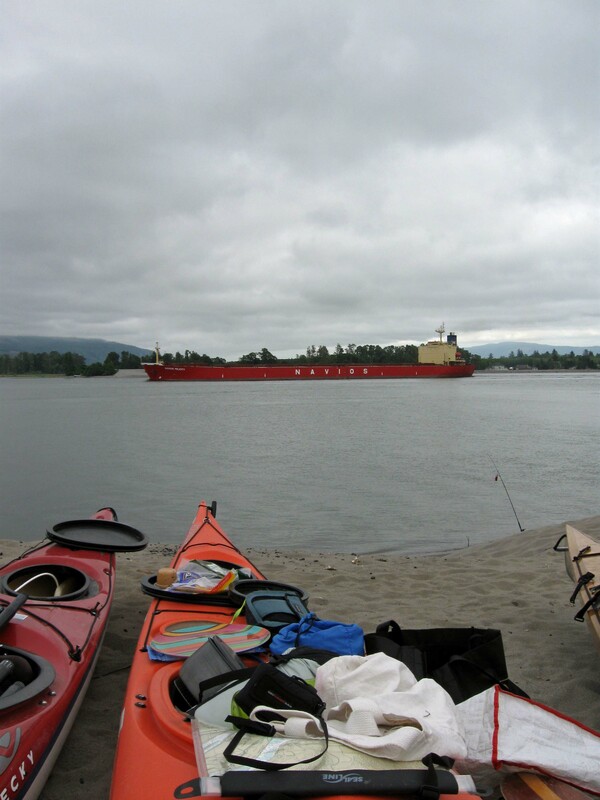 We paddled into Drayton Passage, which lies between Anderson Island and the Key Peninsula. Ahead lay McNeil Island, a Federal Penitentiary we wanted to check out. Unexpectedly the wind picked up substantially! As we entered Drayton Passage the wind picked up from the south/southwest to maybe 18 knots with whitecaps. Fortunately tide wasn’t much of a factor. It was against us, but it wasn’t strong. Like a mother hen, I doted over the group and especially Bibi and Michelle. Monte did a great job of sticking with Michelle. The wind and waves grew and a few breakers sent water across my foredeck. 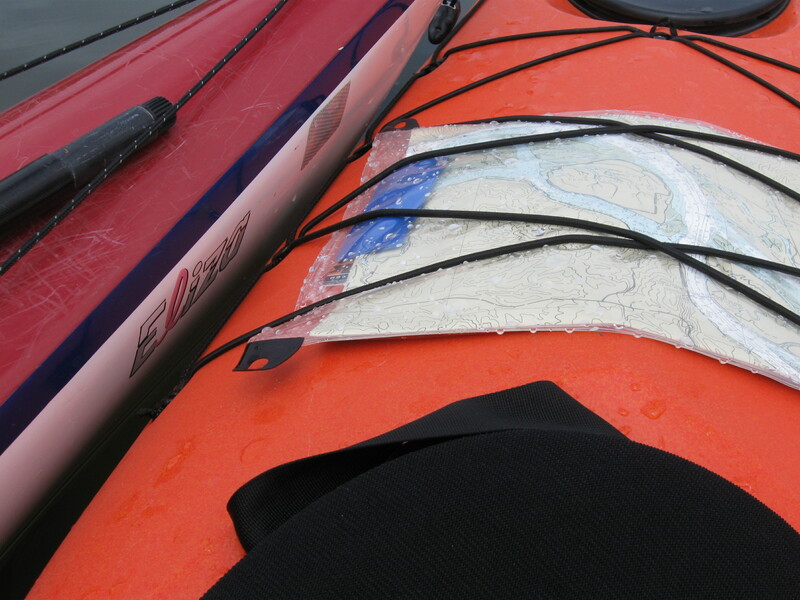 My charts were not totally water proof – so I relied on Deborah and Warren’s protected charts. Crossing Drayton Passage, we encountered lots of traffic. Deborah sent out a hail over VHS to alert the power boats we were about to cross. Checking my watch, I notice the time kept moving on. It was already 1:45 mid way across the passage. Once across, I polled the group about Eagle Island. 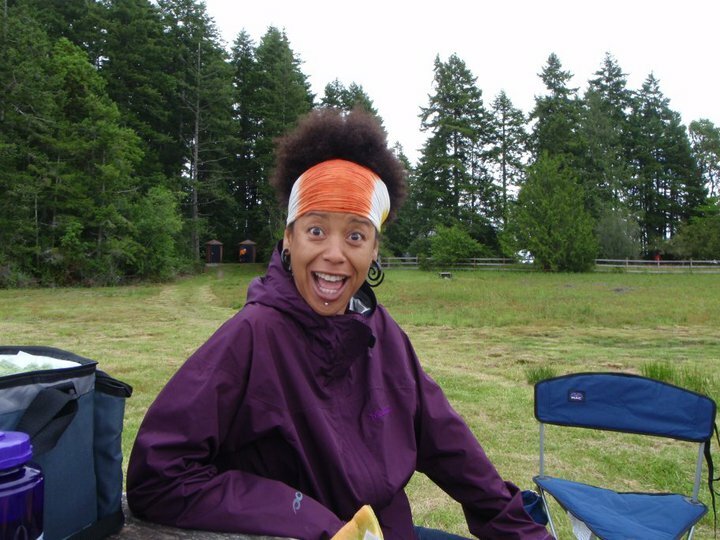 Michelle was going to head to our campsite with Monte no matter what – she was tiring. We all decided it was not a good idea to try to make Eagle Island and then paddle all the way back to the camp. 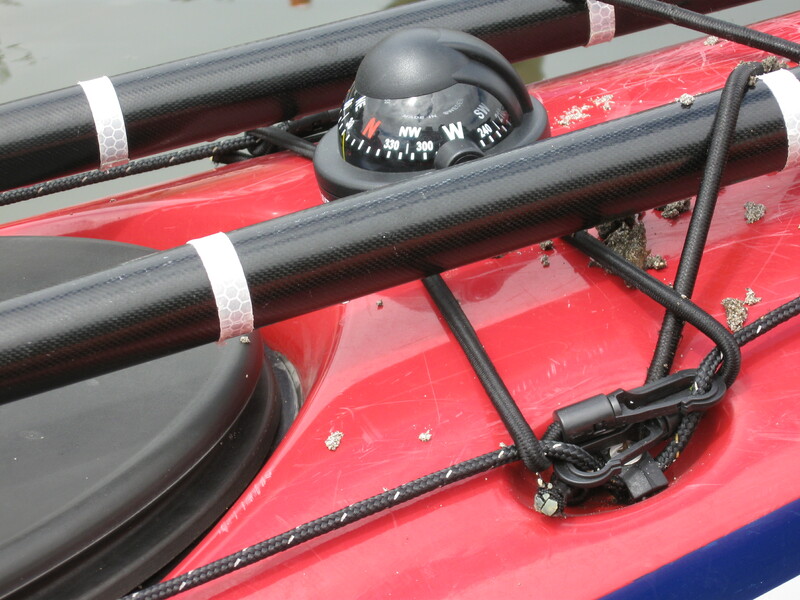 Too many paddling miles in this 18 knot wind. So after lunch we abandoned Eagle Island ambitions and began the trek for our spot on Anderson. Plunging into breaking waves was, for me, lots of fun! My Valley Aquanaut LV loved it. 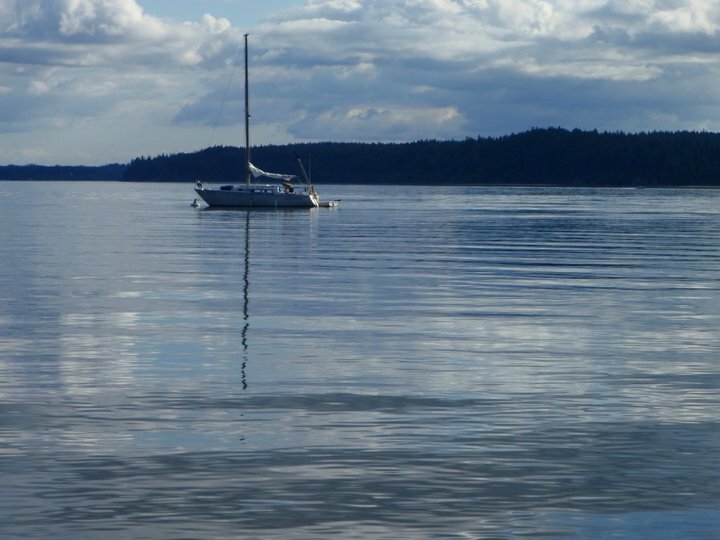 Without skeg deployed, it wanders in calm waters. But in conditions, it tracks true without the skeg and is also rock solid stable. But here, Michelle’s flimsy spray skirt failed her – allowing water from the plunging waves to enter. Fortunately, Warren supplied an extra spray skirt, which solved the problem! We saw smoke in the distance. Coming closer we realized there was a wildfire on the shore! We put ashore to check it out. The 8′ x 8′ fire was burning hot, and above it were large driftwood logs – which were catching fire. Further downwind on the beach there was plenty of fuel. We tried to extinguish it with our water bucket, but we knew it’d probably re-ignite. So we spent some time calling 911 on the cell phone and managed to put a call out to the marine fire department. They agreed to send out a fire boat. We then put some buckets of water on the fire, and then took off. Maybe 15 minutes later a fire boat appeared, found the fire, and used its cannon to stop it. Kinda cool! So far, the waves were coming at us mostly from the bow. This wasn’t much of a problem for our novices. We don’t have any images because we were too busy. But as we rounded the western end of Anderson Island, they’d be mostly to our sides. We were concerned for Michelle and Bibi. I figured they’d need to use a brace more than a few times. Once there, however, it became apparent that close to shore, the wind calmed down a lot. The island has one hundred foot high headlands – and a phenomenon was occurring there which reduced the wind. Sometimes when a wind comes directly at a headland, it lifts several hundred yards offshore, leaving the space near the shore much calmer. We could see that far above our heads, the trees were swaying, yet for us, there was not nearly as much wind. We could also see that there were whitecaps further out, but not where we were. We came to the spot we assumed was the camping site I’d reserved through the Washington Water Trails Association. But a sign said NO OVERNIGHT CAMPING very clearly. Warren and I asked folks on the beach and they told us our site was 1/2 mile down island. Well, once we reached the end of the island with no site, we decided that the original site was in fact our place for the night, regardless. The information in the Marine Trail Guidebook must need updating? After the trip, I learned there is usually a water trails sign on that same post but it was missing. It’s a very pretty site, located on the end of a sand spit with a lagoon behind. It was about low tide, so we were careful to check signs of high tide and pitch tents well above. You can see all up and down the opposite shore from there. It would be great for fireworks viewing! The grunt work of carrying boats up from low tide took a while, but with team work we got the job done! 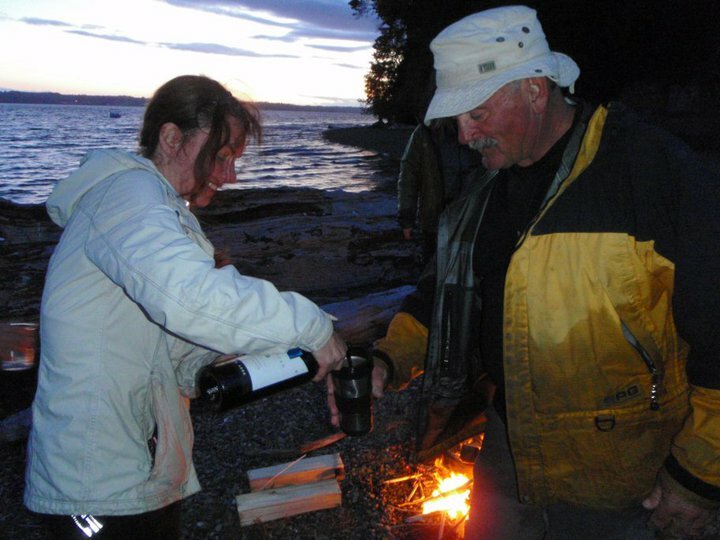 Michelle brought some wine and Warren had a bit of scotch, both welcome after this long day’s paddle! Monte accepts some wine – well deserved! 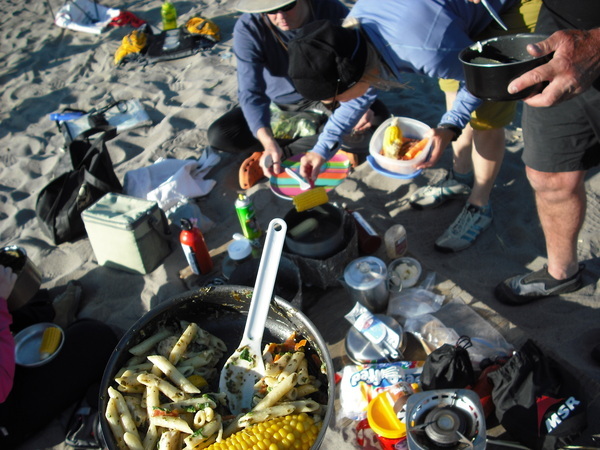 All forms of backpacking food were brought out and cooked up. Warren and Deborah were the most prepared with dehydrated/vacuum sealed food they’d done at home. I had my usual Lipton pasta mixed with a pack of meat with a side of fresh greens, and Michelle had lamb she’d cooked earlier in the day. Just past dinner twilight brought desire for a campfire. We gathered some wood and sparked a little beach campfire, and we all agreed we were privileged to have this spot, view, and atmosphere all to ourselves! As night set in the opposite shore lit up! Some community fireworks began to really show their stuff by 10:00 and private fireworks displays were going on everywhere. I had my own cache, which we indulged in! In Washington most fireworks are legal! Hooray! Fireworks continued to decorate the opposite shoreline all night – some people must have broke the bank to keep going on like that! Pretty cool to watch! Summer has finally arrived in the Pacific Northwest! 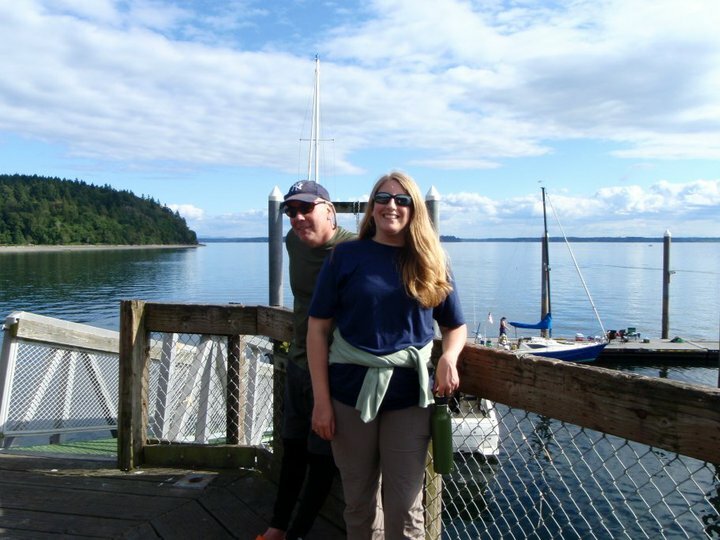 Time for island hopping on the Cascadia Marine Trail! As a Meetup organizer, I’m always thinking of ways to put quality events on the calendar. 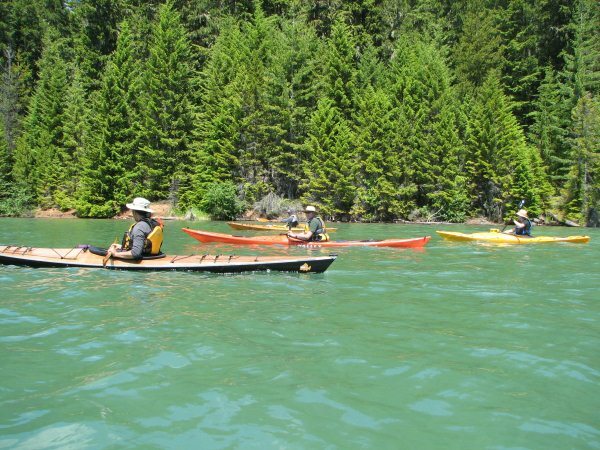 My PaddleNW group has a lot of novice paddlers, yet I’m always jonesing for a challenge. Sometimes a challenge is the conditions, other times it’s planning/packing for overnights. And for me, as the guy leading, there are group management responsibilities. 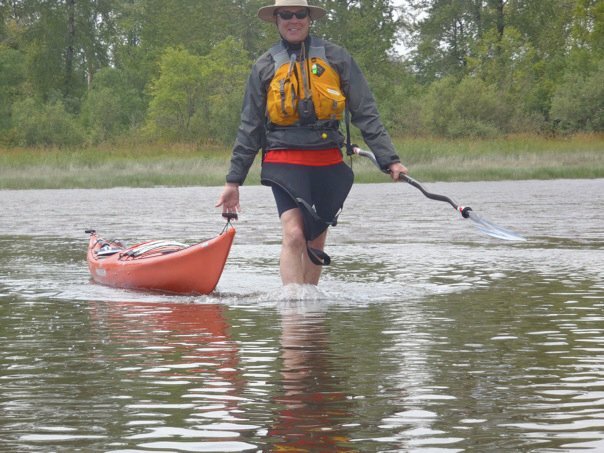 Equally challenging is forcing myself to schedule what to me is a boring paddle. 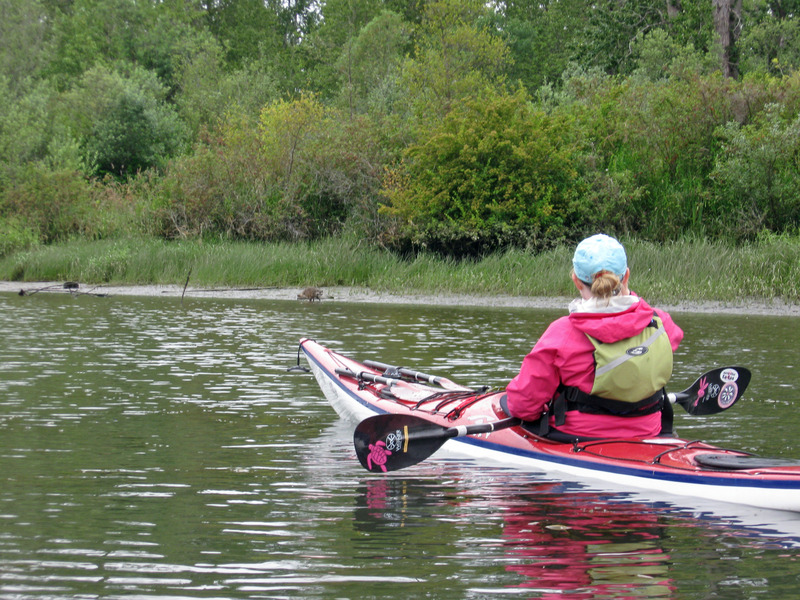 We hadn’t done a multi-day paddle with a different destination each day before. Further, we’ve only done one salt water overnighter. I thought it’s high time for an island hopping trip. 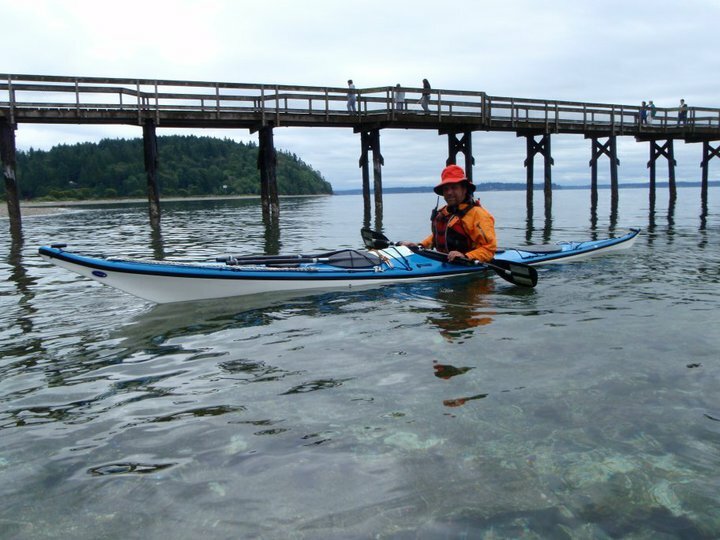 Research revealed the Cascadia Marine Trail in Washington’s Puget Sound as an excellent choice for such a trip! 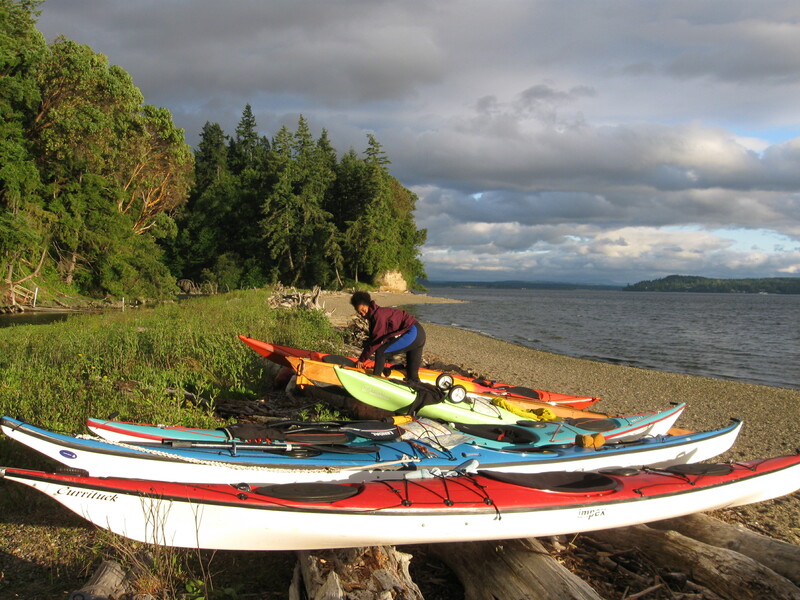 There are paddle-only campsites sprinkled all around the Puget Sound. 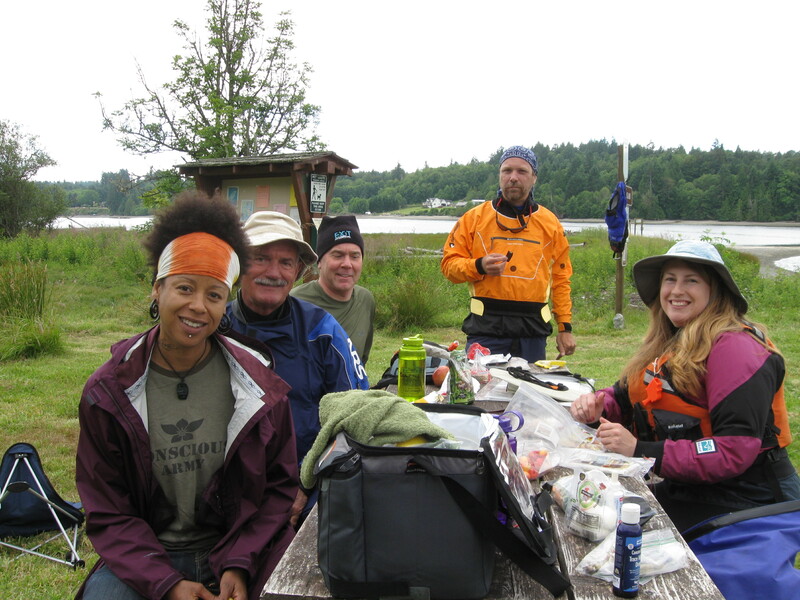 For the July 4th 2010 holiday, I planned a multi day kayak camping trip for my Paddle NW Meetup group. 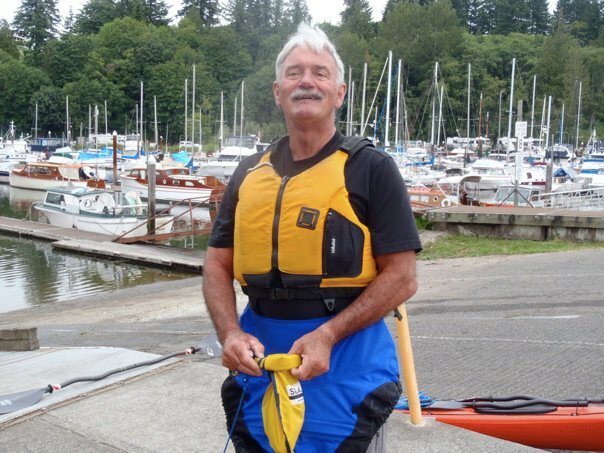 The planned route would take us from Zittel’s Marina to McMicken Island and then camping at Joemma Beach, followed by a day on Anderson Island and then return to the put in. 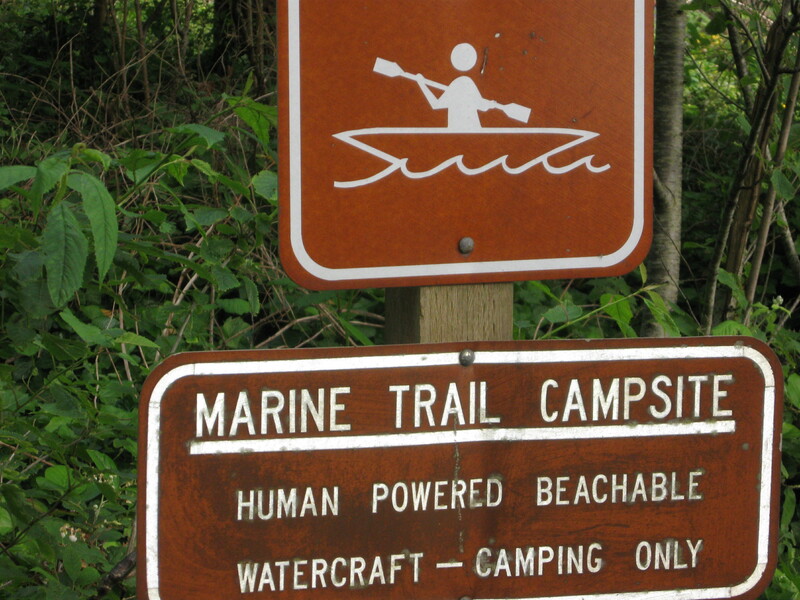 We’d be using sites along the Cascadia Marine Trail to camp. 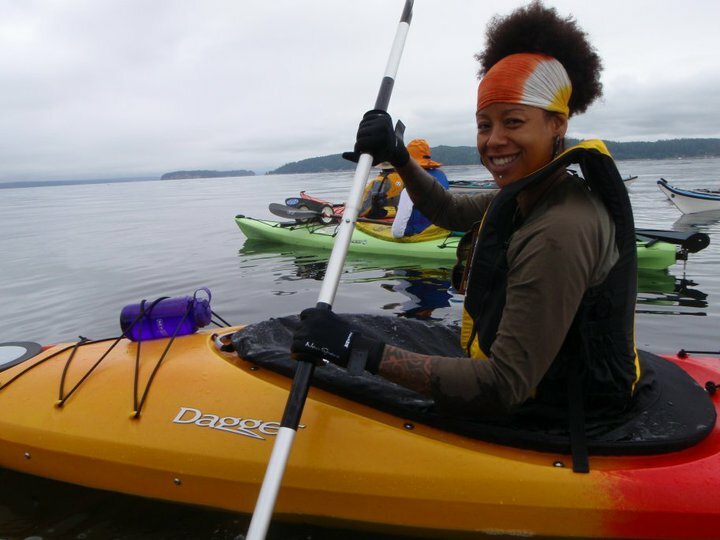 Kayaking in the Puget Sound requires more planning than a trip to a lake or along slow moving rivers near Portland. It’s bigger water, and tides are a major consideration. Simply put, you must plan for the tides, or you might get caught facing a strong current. 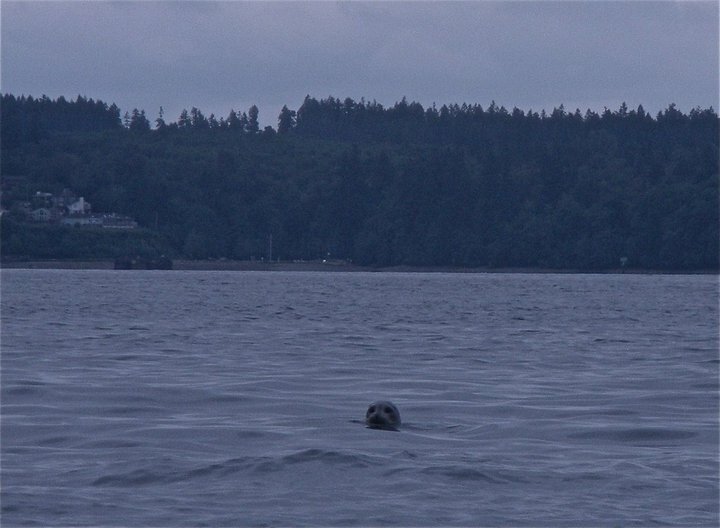 Tides can be 14 feet in the Puget Sound. They accelerate at narrow points between land formations, and sometimes the current is over four knots and squirrely. So I planned our route to be with the tide as much as possible. Gear must be stout enough for strong winds and waves. A VHF radio is strongly recommended. Charts are mandatory. experienced at this type of paddling except Bibi and Michelle. I spent time preparing them for this trip. Two weeks prior, I held a wet exit and rescues class for them. I also spent time educating them on packing for a kayak camping trip. For the 48 hours prior to this trip I e-mailed back and forth trying to ensure they had the right gear. Bibi got extra dry bags and an extra compact camping pad. Michelle did well on food preparation. But my concerns were justified. Michelle didn’t stage her kayak packing prior. That morning she was struggling to get everything into her boat. She brought an over sized sleeping bag without a dry bag. That could have spelled real trouble. And her spray skirt wasn’t really sturdy enough to shield from lots of water coming over the deck. Luckily Warren carried an extra spray skirt. Michelle had a great time, but she was just unaware of the potential danger! Everyone had appropriate immersion wear. At the put in, we gathered and began packing kayaks. 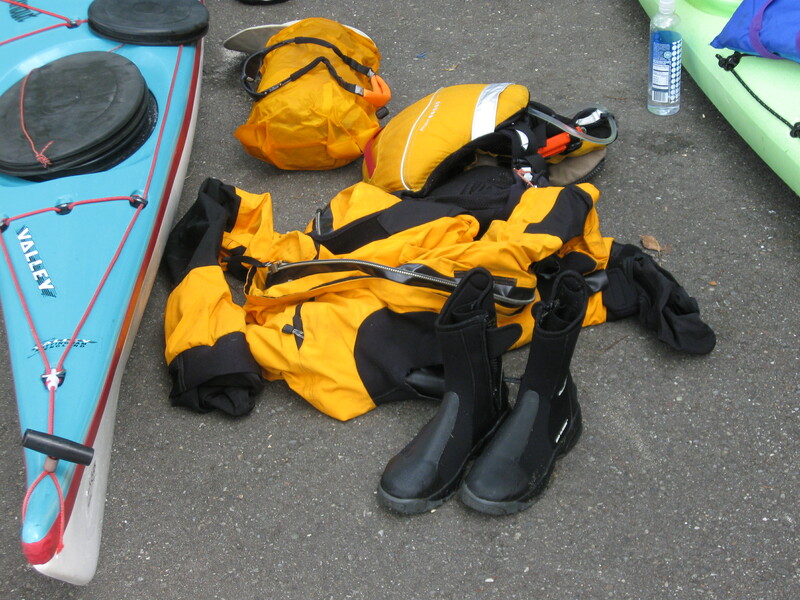 Deborah’s gear was the standard…dry suit, booties, PFD and the VHF radio all are good to have! The Puget Sound is about 50 degrees. Sometimes wind and waves come up unexpectedly – so well fitting spray skirt, bilge pump, dry bags are totally a must! Everybody packed quickly. 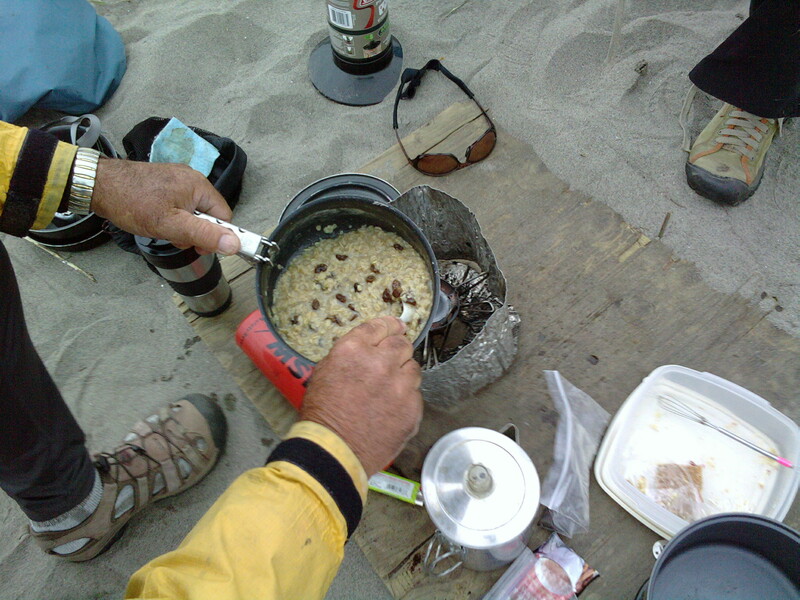 We got off to McMicken Island, our lunch destination, by about 10:00 a.m.
high tide; after that the tide goes against us. Dana Passage can have some strong current. The day began cloudy and it looked like there might be showers. But with calm wind we made good time! We were escorted by seals and porpoises along the way! Up at McMicken we beached on the back side of the island, and made ourselves home at the picnic tables for lunch. McMicken is a state park – it’s a day use island, though. You can’t spend the night. Lunch was a festive affair, followed by a hike around the north side of the island. Then we took off southeast, for Joemma Beach State Park – our stop for the night. Paddling was pretty simple. Winds were less than 5 knots and we only encountered power boat waves. The sky opened up revealing a jeweled south sound for us. The Olympics briefly revealed their snowy peaks. At Joemma, we went about setting up camp. Turned out we had all the marine trail and pedal campsites to ourselves, and even the picnic area! Good thing, because the sites were small. So small only one tent per site was possible…nevertheless we took everything over! The camping at Joemma Beach is high above the water so you get a great view! 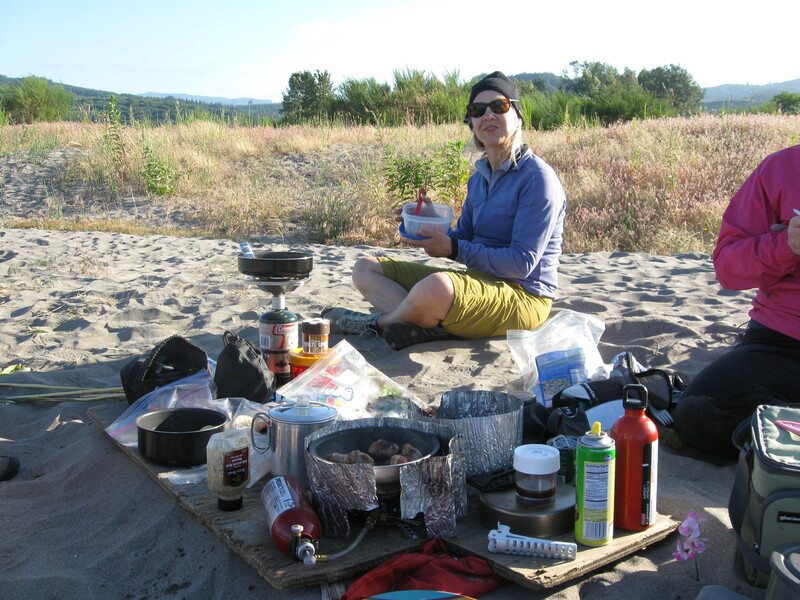 The picnic area afforded a generous kitchen, and a parking spot for our kayaks. Warren and Deborah, both using bivvy sacks, slept down there to guard the equipment. 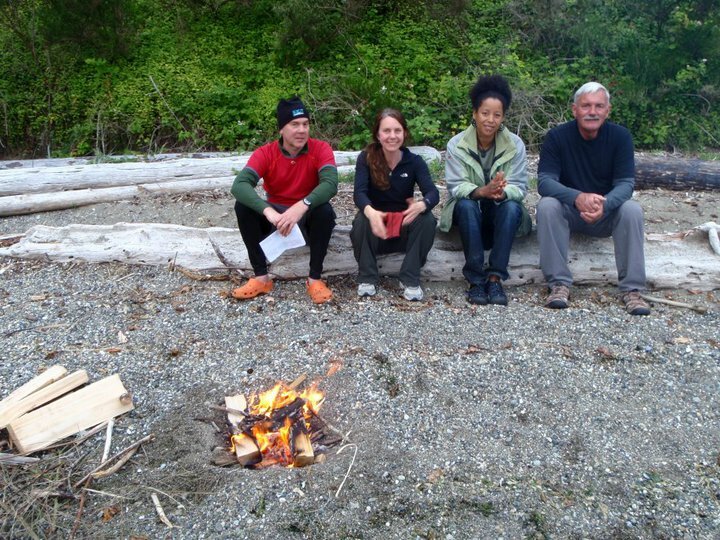 Down on the beach, we risked arrest by starting a little campfire. Not long after we were enjoying it, a ranger showed up…with a bucket for water to put it out! She was totally cool. She helped us extinguish the fire and then showed us a place where fires are allowed. This night fireworks began to light up the sky on the shore opposite our campground. We spent time on the pier watching….some people had some serious coin to fire all those fireworks, some went on for hours! Sunset was very mellow, with reflective views of the sailboats anchored just offshore. Warren relaxed reading a book to the view. There’s a long pier which affords a great view. April and I made the most of it! Eventually, the days activities wore us down and it was time to crash for the night. 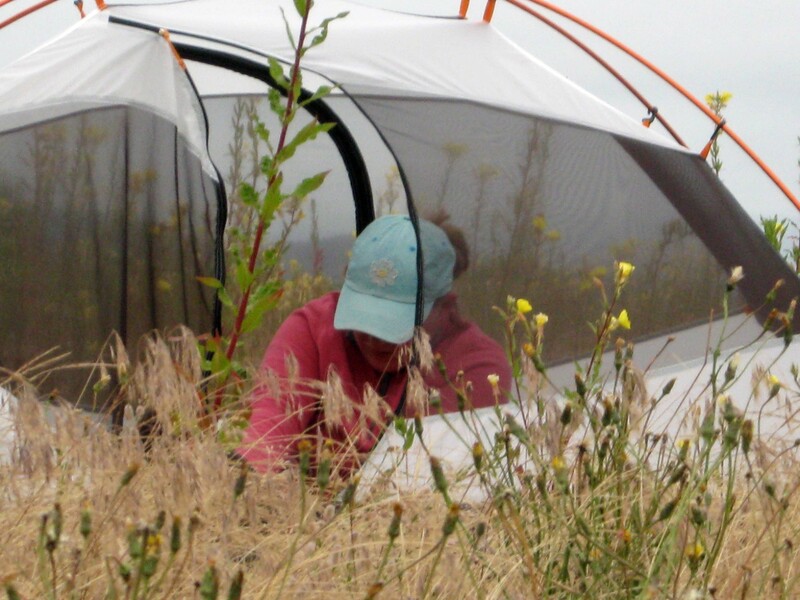 I elected to forgo my tent fly – excellent choice. The stars were brilliant! I brought a face mask and ear plugs, which came in handy as the sky was bright by 5:00 a.m. and I was told crows were a-crowing! Morning broke bright and clear! 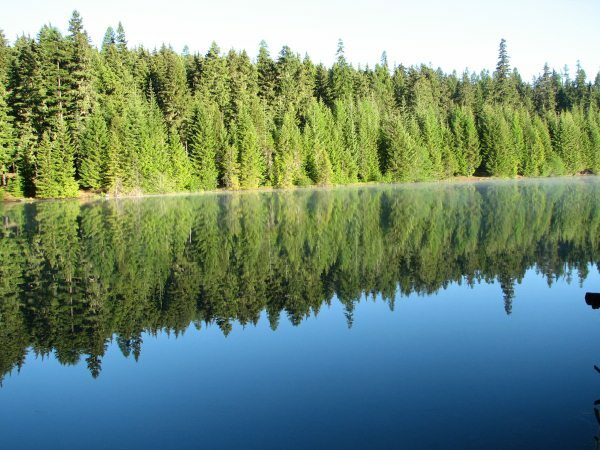 The sunlight bathed the forest opposite in a warm glow – reflecting perfectly on the water in between. Another nice day on Timothy Lake had begun. 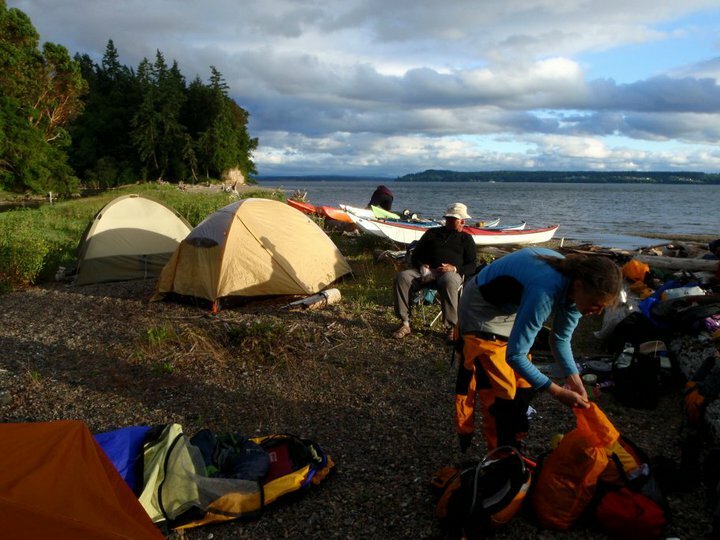 Slowly but surely, tents were unzipped and kayak campers emerged, rubbing eyes and hungry for breakfast. The fire was brought back to life and camp stoves revved up for cooking. Seemed everybody had the same idea – oatmeal with assorted accompaniments like nuts, yogurt and fruit. Coffee and tea were consumed heartily! Nobody was in a hurry; we were content to experience the day’s warm-up and then take our time breaking camp. Our mellow mood attracted a guest! 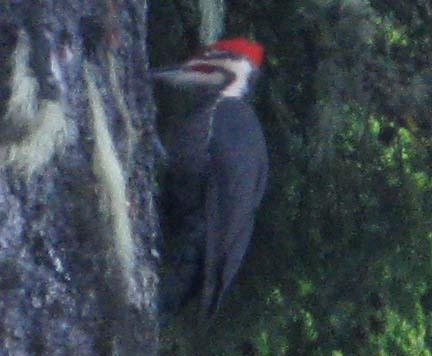 For about 15 minutes a hungry Pileated Woodpecker pecked the douglas firs in and around our campsite foraging for breakfast. Up and down the trees it went, offering numerous photographic opportunities. This was the first time I’d seen one in Oregon, and I felt privileged in its presence! The day’s plan called for a relaxed return to our start at Gone Creek Campground, with a lunch along the way. Wow, the color of the lake was truly spectacular! I could not figure why it was such a bright blue this time around. We nuzzled into a sunny, south facing campsite for lunch. Next we hugged the rocky east side of the lake on our return. I tested out my new LevelSix tow belt. 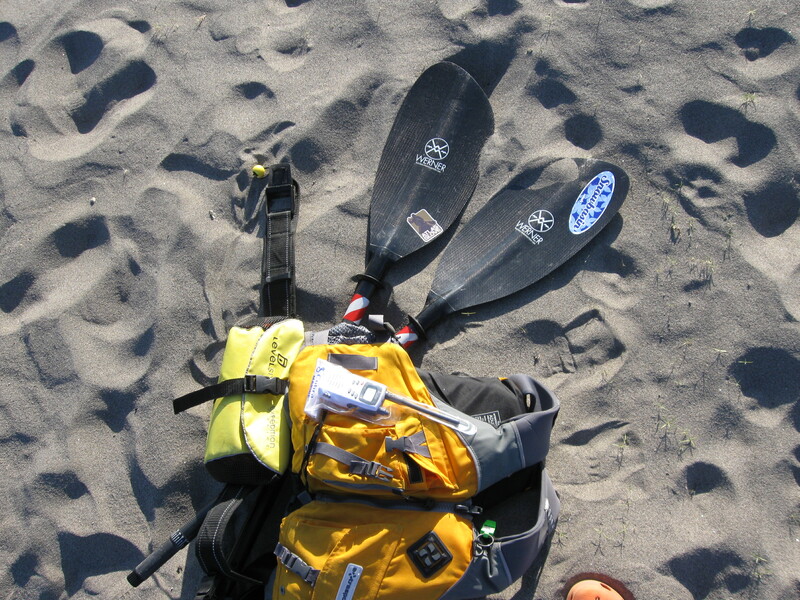 Very nice gear – and my fellow paddlers provided plenty of resistance!